A used cooking oil recycling scheme which sees Lincolnshire residents recycling waste oil into renewable energy is celebrating its fifth year. The scheme, which aims to divert waste cooking oil from sewers, was installed by Lincolnshire Council in 2008. Currently, an estimated 129,000 tonnes of cooking oil is disposed of down the drain by UK residents each year, which results in a countrywide bill of around £15 million in cleaning up blocked sewers. However, Lincolnshire residents can rid themselves of a sticky, messy waste at their local household waste recycling centres (HWRCs) and help to power the UK’s lights at the same time. Once collected from each of the county’s 12 recycling centres, the waste oil is taken by eco-firm Living Fuels to their recovery facility, where it is naturally settled and filtered into an environmentally friendly bioliquid, LF100. This bioliquid is then used in the company’s renewable energy stations to provide carbon neutral power for the National Grid at times of unexpected demand. 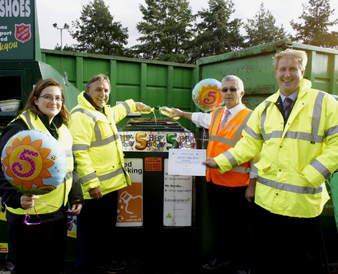 Photo shows Johanna Walker, Sustainability Education Officer for Lincolnshire County Council; Cllr Reg Shore of Lincolnshire County Council; Mark Johnson, FCC Site Manager and Sean Kent, Lincolnshire County Council’s head of services.